53 year old female who was feeling like she looked tired all the time. She desired a more rested appearance with less bags under the eyes and a more alert and rested look to the upper eyelids and brow. 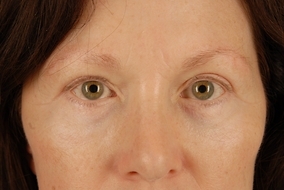 She had a browlift together with the upper and lower blepharoplasty (eyelid procedure). 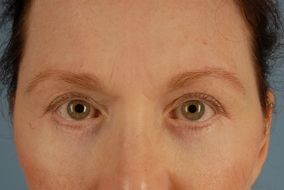 Dr. Azar performs the browlift through the upper eyelids not on the scalp. You can see it does not make her look suprised, only rested.